The article below is by guest author and friend of RideFatbikes.com, Ben Welnak. Ben is an avid mountain bike enthusiast and racer, and is an owner of Twenty2 Cycles. His personal blog is well worth reading, and you can check that out at BenWelnak.com. Ben’s cycling and racing perspective and insights can also be found at XXCMag.com, as Ben recently joined Jason and Zandr to do the weekly XXC podcasts ( http://xxcmag.com/xxc-podcasts ). At RideFatbikes.com, we’re fortunate to have Ben contribute some of his insights and thoughts to issues such as the one below, which is likely on the minds of many of us “fatbike afficionados” as we enter the spring riding season. If you want to discuss the issue Ben raises, feel free to leave a comment here inline with the article, and we can get the discussion rolling. This winter has been a very interesting one in the mountain biking world. Fatbikes have stormed the scene and left a wake of a whole new range of frames, components, wheels, clothing, races, and other accessories. Many riders have taken advantage of several new options to take the plunge into buying a full new bike for the offseason. They’ve realized the change in mindset that the fatty tires bring. Now, snow, paths, frozen lakes, rocky shorelines, sand, and any other type of riding is just plain fun. It’s March, daylight savings time starts next weekend, and spring is right around the corner. You have big heavy fat tires and 80mm rims that you bought to prepare for the frozen months, which didn’t seem to appear in a lot of the country. Now, with thawing dirt, are you going to hang up your brand new bike? Or…will you get it rigged up a little different so it’s ready to rock on your regular riding haunts too? They are great in all conditions, but I understand how all of us think. If I could just have a lighter setup with these big wheels, I could keep the fun and make it a little quicker and easier to get through the hills. We’re always looking to upgrade – if this frame was a little stiffer, this wheel a little lighter, these treads not so much of a drag on the ground. 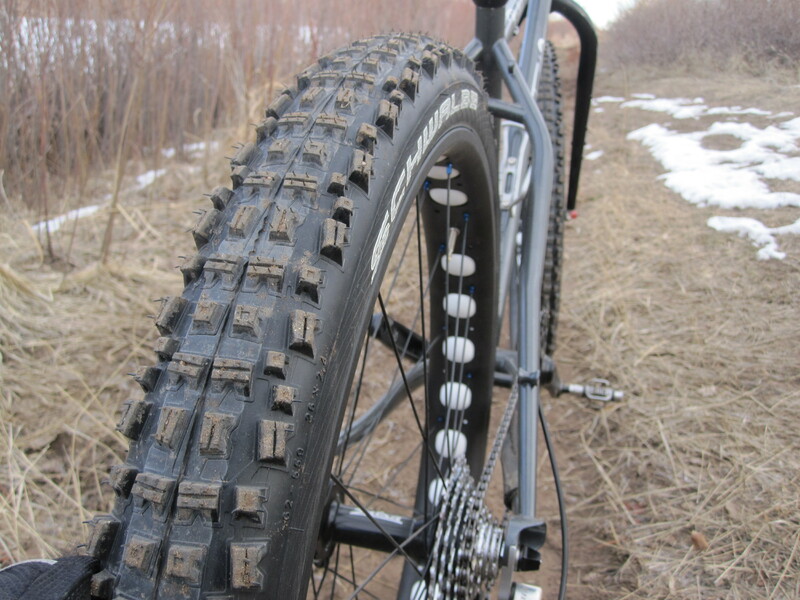 There are talks of “skinny” fatbike tires out there and I’m sure that, after this booming year, there will be plenty of options coming on board at some point in the future. I thought it would be cool and (hopefully) helpful to try out some different tire options to give you an idea of other options out there to drop weight and make your rig a little faster for the summertime singletrack. This isn’t meant to be the most technical discussion or a specific gear review article. There are plenty of other great people doing that kind of thing already. Rather, it’s meant to be a look at what options are available, try them out, and share the information. I’m not sure how many pieces I will write or where this will even lead. Maybe nowhere and maybe it kicks off a little discussion. We’ll see. I’ve started out with Schwalbe’s Big Betty freeride tires. At a claimed weight of 870 grams and a width of 2.4 inches, it seemed like a good option to test out. I mounted them to 65mm wide Surly’s Marge Lite rims and kept the pressure around 20 psi. The tires stretched out to a little over 2.6inches, with the tread a little bit narrower than the sidewalls. Not enough to be any issue, but should be noted I tend to start with a fuller tire and then go down from there. Mounted on my Twenty2 Cycles Bully, which is designed for the “traditional” fatty tires, it was an over fun ride. I’ve only done a little riding on them so far, but it was on some frozen singletrack. The pavement ride to the trail was relatively good. It wasn’t a smooth road tire or a regular 29er tire, but it’s not meant to be. It rolled good for a fatty tire, although it did seem to pick up a lot of small stones. To be expected with a tire with such tread, but it’s noticeably more than you’re probably used to with the other fat tire options. I definitely have plenty more testing to go on these to feel the full effect. Stay tuned to RideFatbikes.com as I do more testing and writing about these Big Betty tire setup. I will continue to try these out on the Bully and see what I think as I hit more thawed out mountain singletrack. I’m interested in trying some of the new tires later this year and see what is possible with some of these setups. Feedback is definitely welcome. I’d love to hear what everyone else is running and what ideas you have. Feel free to contact me directly at ben@twenty2cycles.com. It was not long ago in fatbike land that a question like “which fatbike is the best” or “which fatbike rim is the best” would have only two or three possible answers. Fortunately, those times are behind us, and with great companies like Surly, Salsa, 9 Zero 7, and Fatback, the options are improving. Recently, Surly announced that they are upping the ante with the 100mm Clownshoe rim (See the Aug 24th post at the Surly Blog, here: http://www.surlybikes.com/blog/). Since that rim has cutouts for weight savings and 64 hole pattern for offset or non-offset lacing, it is an awesome option for ultimate flotation. The only trouble is, it’s due sometime in 2011, and I haven’t seen or ridden one. 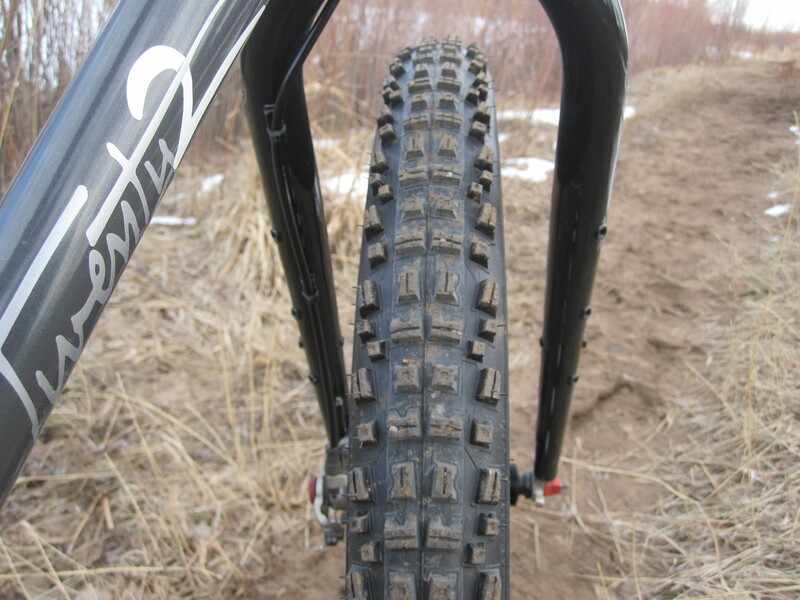 If any Ride Fatbikes readers have seen/ridden this rim, please offer some feedback. As alternatives to the 100mm Clownshoe, there are options like a 100mm or 80mm FlatTop from Chain Reaction Cycles in Alaska: http://www.chainreactioncycles.us/Flattop%20Rim.html. These also look like great rims, though I’ve not had the chance to ride them. From the Chain Reactions cycles website, it appears these rims run $125/each in 80mm or 100mm, and $175/each in the drilled (cut-out) version. Beyond the beefy 100mm Clownshoe and Flattop options, there are the “standby” offerings from Surly, such as the good ole Large Marge: http://surlybikes.com/parts/large_marge/. The Large Marge rims, ironically, are almost “small” by today’s standards, at 65mm. If you’re looking for more float, but you don’t think you need 100mm rims (or your frame won’t accommodate them), the Rolling Darryl (also from Surly) is an 82mm wide cut-out rim that can be laced symmetrically or asymmetrically for offset or non-offset frames. As a single-wall welded seam rim, it’s even lighter than the smaller Large marge rim. I am currently riding the Rolling Darryls, and they seem well constructed, and do the job well. I can’t compare them to the other rims available, as I haven’t ridden the others. For those of you who have direct comparison experience between multiple fatbike rims, what are your opinions? What rims do you run, and for what reasons? Let’s make RideFatbikes.com a fatbike community – offer your comments/feedback/reviews, and we can all benefit from the fatbike knowledge and experience of others on this site. Please tell your friends about RideFatbikes.com or follow us on Twitter @ RideFatbikes.